This chapter is an introduction to the basic theory, practice, and instrumentation for EPR spectroscopy. 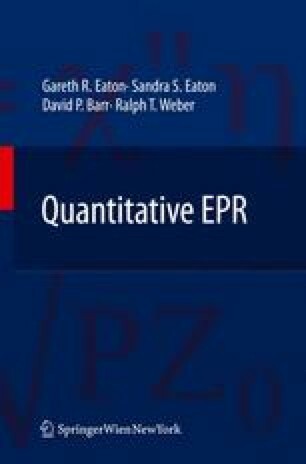 It is designed to give someone who is new to EPR sufficient background to understand the following chapters. A reader who is already well acquainted with the basics of EPR theory and instrumentation, may skip this chapter. Topics in several sections of this chapter are presented in greater detail in subsequent chapters. This introduction, and much of the book, focuses primarily on molecules with a single unpaired electron, which is denoted as having a spin state of S = 1/2.